The Checkerboard Test Chart is available on matte inkjet, photographic paper, film, and chrome-on-glass substrates. It is designed to work with the Checkerboard module. This module enhances testing of varying distances by supplying more testable regions to provide automated measurements of sharpness, lateral chromatic aberration, and distortion from images. 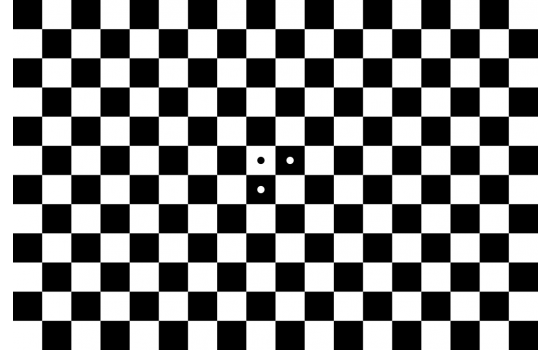 Learn more about the Checkerboard Module. Please note that this module runs slower than eSFR ISO and SFRplus modules and is less tolerant to extreme amounts of defocus or blooming degradations. The Checkerboard Test Chart is available in Visible Spectrum and Near Infrared. In Visible Spectrum, choose between matte inkjet, reflective photographic or transmissive LVT film substrates. Contrast ratios include 4:1, 10:1 and 45:1 for the inkjet and photographic charts, and additional 100:1 for film targets. All inkjet, photographic, and film options are printed with 12 vertical squares. Chrome on Glass Checkerboard Targets are also available in the "NIR and Visible" category, with 10:1 contrast ratio. Choose between 2" or 4" with 1mm (30x30), 2mm (15x15), 4mm (7x7 or 20x20) or 8mm (10x10) square sizing. Or select 1"x3" plate with three patterns: square size and dimensions are 0.042" (10x20), 0.021" (20x20) and 0.011" (40x40). Learn more about the Checkerboard Module. * The Large Photographic size is currently under development. Please inquire to charts@imatest.com to place an order for this item.